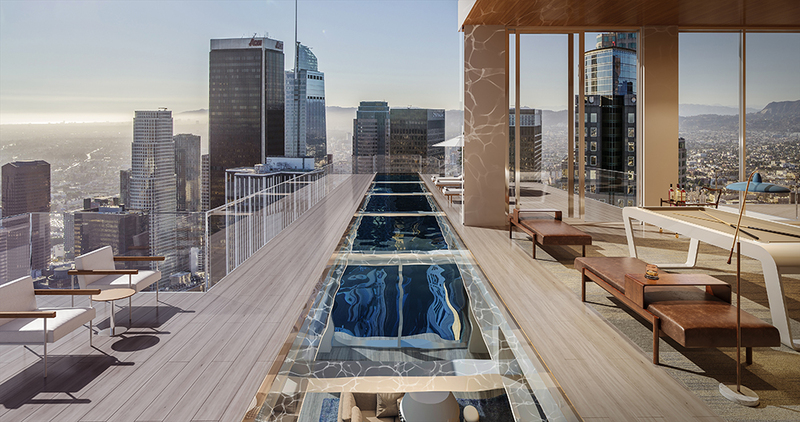 New renderings dropped for Arquitectonica's pool-topped Jenga tower in L.A. - Archpaper.com New renderings dropped for Arquitectonica's pool-topped Jenga tower in L.A.
Arquitectonica and JMF Development Co. are moving forward with their plans to building a striking 53-story tower adjacent to Pershing Square in Downtown Los Angeles. 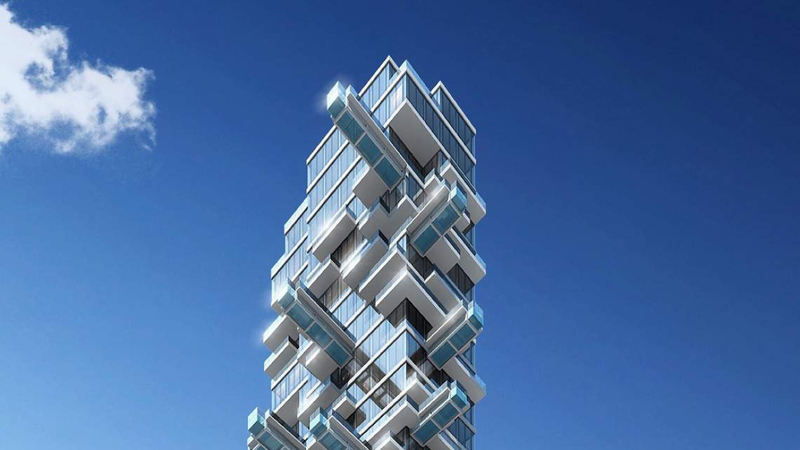 The City of Los Angeles Department of City Planning recently published a draft Environmental Impact Report for the so-called 5th and Hill project that includes a new rendering for the transformative 789-foot tower, Urbanize.LA reported. Two potential options for the tower could be built-out depending on economic conditions. Option A for the project calls for a mix of residential and hotel programs, a scheme likely developed in anticipation of a potential recession, which could depress property values and therefore, lower the final sale price for each of the condominium units. This plan includes a 190-key hotel, 31 condominium units, and 29,232 square feet of restaurant space. Option A would include automated parking for 126 vehicles. Option B would bring 160 one-, two-, three-, and four-bedroom condominiums to the site along with 20,431 square feet of restaurant space. The scheme would include automated parking for 187 vehicles. 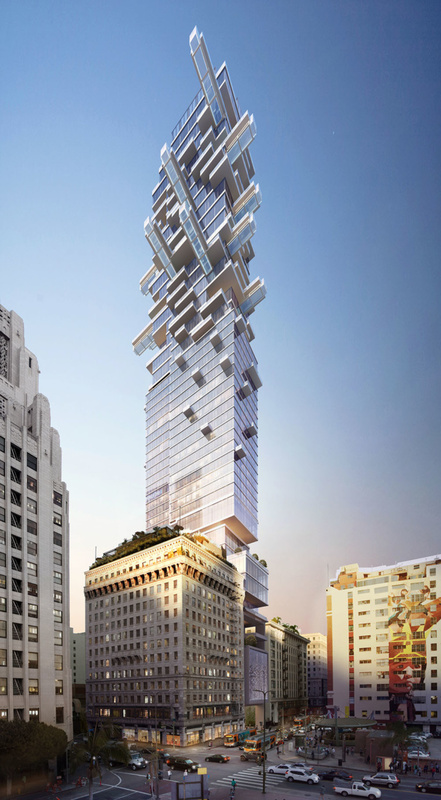 The tower is planned for a tight, L-shaped site that wraps the historic Pershing Square Building, which is also owned by JMF. The lower levels of the complex would feature staggered floor plates and multi-story cut-outs that would contain amenity spaces, including the building’s restaurant. A more regular, glass curtain wall–wrapped volume is set to rise above the podium levels. MJS Design Group will provide landscape architecture services for the project. 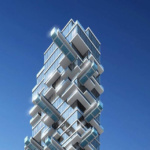 As the tower rises, however, the outline of the spire is set to explode in a collection of protrusions, including cantilevered swimming pools and other amenity spaces. The protrusions start off as balconies around the midpoint of the tower and gradually increase in size and depth as the building climbs. 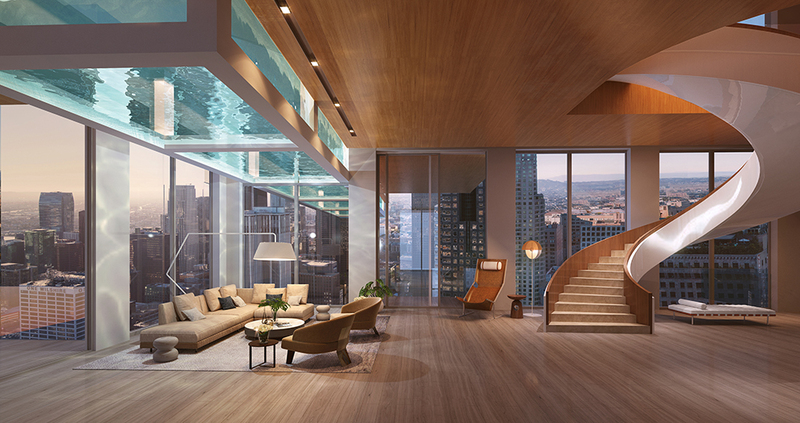 The uppermost levels are cross-crossed by projecting swimming pools and overhanging floor plates. The project represents a modest but practical update to an earlier scheme for the project developed by CallisonRTKL. 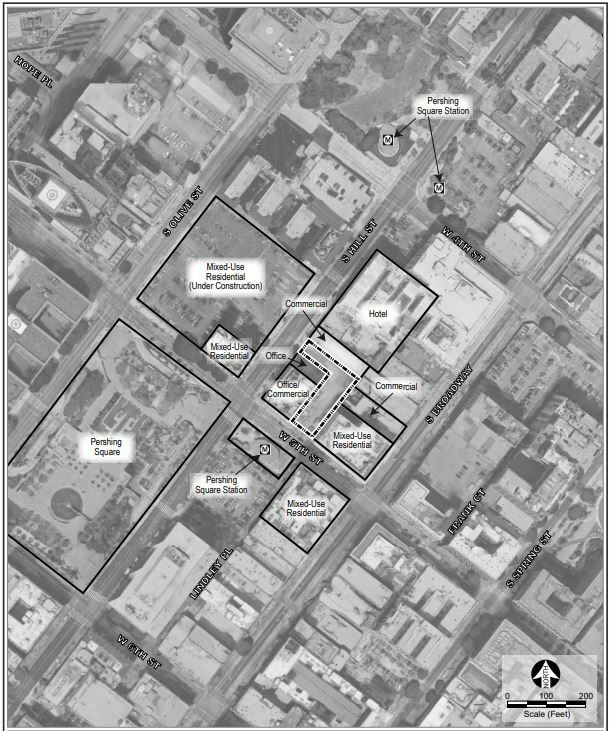 The scheme will join the nearby Park Fifth development as one of two new structures slated for sites surrounding L.A.’s Pershing Square. A team led by French landscape architects Agence Ter is working to renovate Pershing Square as surrounding blocks undergo an upscale transformation. The 24-story, two-building Park Fifth project is designed by Ankrom Moisan Architecture and will feature 660 apartments and 14,000 square feet of ground-floor retail. It is slated for completion in 2019. A project timeline for 5th and Hill has not been finalized.